Steve Ditko: A Remembrance The idiosyncratic co-creator of Spider-Man, Doctor Strange and many lesser-known comics characters died last week. His distinctive storytelling style shaped generations of comics readers. The reactions tended to focus on various, discrete, highly specific aspects of his legacy: His faces. His fingers. His formalism. His far-out dreamscapes. His fierce adherence to a Randian worldview. Me, though? I thought of his sparkles. More on them in a minute. First, let's tick off those facets of his work that left such an impression on people. Consider: Here was a guy who put his hero — and not just any hero, but freaking Spider-Man, whose whole deal is just how achingly, embarrassingly relatable, and friendly, and (not to put too fine a point on it) downright neighborhood-y he is, in a full-face mask. Let's agree: That was a gutsy move. Sure, Batman had been around for decades, and his cowl covered something like 5/6ths of his big ol' melon's surface area, but Bruce's chin and mouth were exposed, so at least you could see him grimace, or gasp, or smile (it was 1962, Batman still smiled back then). Comics are a visual medium — readers need to see the characters' facial expressions to stay emotionally engaged. But Ditko loved drawing inscrutable faces — masked, half-masked, or sunk in shadows. 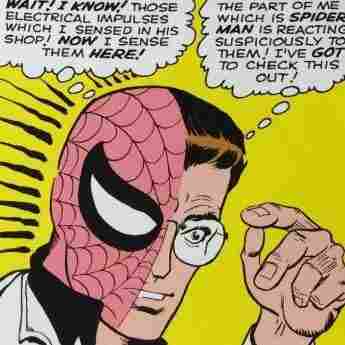 In 1967, he went even further, creating a character called The Question, whose gimmick was a mask that turned his face into a featureless pink smudge. Talk about inscrutable. You couldn't scrute that mess if you tried. Ditko drew powerfully expressive hands, forever restless, forever gesticulating, the fingers dancing, curling or, say, folding into position to shoot Spidey's webs (THWIP!) or accompany Doctor Strange's mystic incantations ("By the wondrous winds of Watoomb!"). (In these capacities, both Peter Parker and Stephen Strange favor the "hang loose" hand gesture known to surfers as the shaka sign. This is likely a coincidence, as nothing about Ditko's famously prickly personality suggests he was the sort of man to surf, or for that matter to hang, and anyway if he ever did, it was certainly in a manner nobody would think to describe as loosely.) In Spidey's case, you could argue that all that complicated hand-business was Ditko simply making up for the fact that he'd taken facial expressions off the table as a means to convey the character's emotions. But for years after he'd left Marvel behind, you could always spot a Ditko drawing by the hands. Another thing people talked about, in the wake of his death: His formalism. There's something slightly odd, something obsessive, even febrile, in a Ditko panel. His characters bend at sharp angles, as if the panel itself is cramping them, hemming them in, and they relate to one another in physical space in a way that's vaguely off-plumb. They're always looking past one another, and even when he draws them face-to-face, they miss each other's eye-lines, ever so slightly. Then there's that furious level of detail. Think of Spidey's costume: It's a great design, a classic, the little black dress of superhero couture, to be sure — but all those tiny, tiny webs, etched so intricately, so fervently, across the red? Genius — but, from a pure draftsmanship perspective, completely nuts. He was forever doing that — adding texture, upping the complexity with filigree elements that should have seemed fussy and overdone but instead served to subtly define the whole look. Think of the scales on Green Goblin's costume, or how the Vulture has all those weird vertical ... grooves? 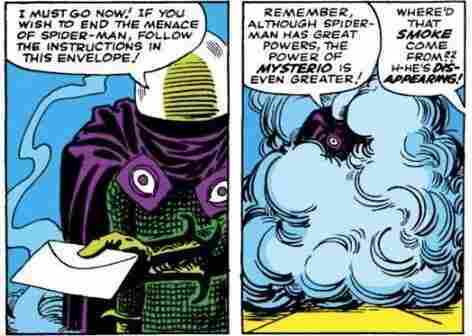 along his body, or the fact that Mysterio's entire damn outfit is quilted. Imagine the generations of comics artists who came after Ditko, tasked with rendering those same, maddeningly meticulous details over and over again, panel after panel, page after page, issue after issue. At some point each one of the must have sat at their drawing tables late at night, eyes straining, hands cramping, cursing the guy's name. But over all that roiling weirdness, Ditko frequently overlaid a rigid, formalist, unyielding nine-panel grid. That contrast created a constant tension, as if the page itself were a cage built to hold all that unsettling, hyper-detailed art, lest it escape into our universe. And finally, his fierce adherence to Ayn Rand's objectivist writings. He adopted objectivism at about the same time he left Marvel in 1966, and he continued to keep his hand in the superhero sphere — though many of those creations, like The Question, Hawk and Dove and, especially Mr. A — strictly adhered to the notion that there was only good, and evil, and no shades of moral grayness between them. His tone became increasingly didactic and extreme, and even though he peopled DC Comic's superhero roster with dependable deep-benchers like Blue Beetle, The Creeper and Shade, the Changing Man, he grew to find superhero comics distasteful. How do we know this, given that Ditko studiously avoided interviews? Because Ditko was reclusive, but not, strictly speaking, a recluse. When fans wrote to him, he wrote back — even if he didn't say anything they wanted to hear. One of the most interesting developments, in the hours following the announcement of his death, was how comics professionals and fans who had written to Ditko over the years began to share the notes they'd gotten back, which they had, of course, saved. Pictures of these brief letters, written in a crabbed and hasty hand and peppered with Randian jargon, started popping up on Twitter, alongside their recipients' rueful, respectful, and fond bemusement. 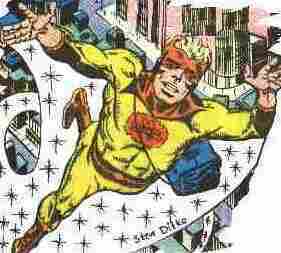 The first thing that I thought of when I read about Steve Ditko's death was Captain Atom's sparkles. When I read about his death I was transported back to a summertime visit to the unthrillingly named Book and Card Store in the West Goshen Shopping Center in the Philadelphia suburb of my youth. I must have been ... what, ten? 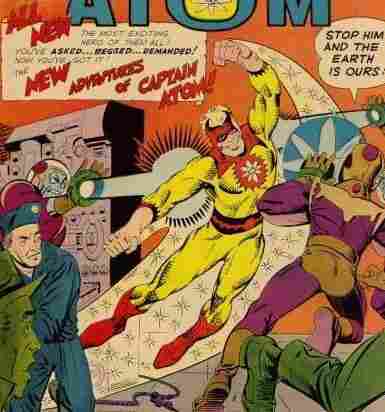 Charlton was reprinting those original Ditko Captain Atom issues, beginning with his origin story; I picked up several issues at once. I remember almost nothing about them, apart from the facts that A. Captain Atom changed his costume a few times ("Like Cher!" I remember thinking, which tells you more than you need to know about 10-year-old me), and B. Whenever he flew through the air, he left a weird white streak in his wake, which was filled with all these sparkly little ... what? I didn't know. Stars, maybe? Glitter bombs? Popping bubbles? Fairy dust? Rubbermaid daisies? Today, of course, possessed as I am of the discerning eye and cool head of middle age, I realize they were most likely meant to represent ... atoms. I mean, duh, right? Captain Atom? But it was the bold visual weirdness of the whole effect that stuck with me. I mean, they don't make logical sense. First of all, that white streak behind Captain Atom — that's not just, like, wind. It's a kind of white, opaque plasma energy that completely overtakes the background in a way that light, for example ... doesn't. Can't. And seriously, if those little sparkly thingies are, in fact, atoms? That means Captain Atom has breached, and is likely leaking contaminated nuclear coolant into the environment, and no matter how charmingly Tinker-Bell-fabulous they look, someone needs to get the International Nuclear Energy Agency on the phone yesterday. But forget about all that. No, they don't make sense. None of it does. But on a purely visual, purely comics level, they just work. I mean, you know what else doesn't make sense? Kirby Dots. For the uninitiated: Another iconic comics artist/writer, Jack Kirby, was known for adding, to his depictions of energy blasts, or vast fire pits, or any sufficiently superheroic explosion of energy, clusters of roiling black dots at their very center. On the page, they're just a bunch of dots — but the mind summarily transforms them into accurate representations of raw, unconstrained destructive force. Now: Jack Kirby's storytelling mode, especially as he grew older, tended toward the bold, the cosmic, the space-operatic. That was never Ditko's thing. His mood was always more inward — fretful, frenetic, cerebral. 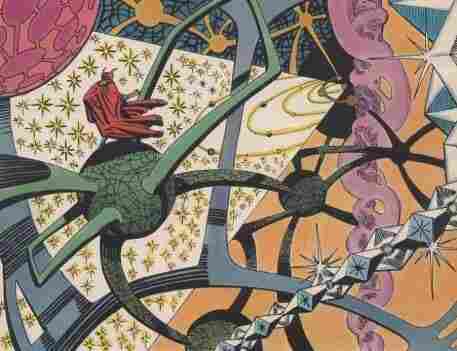 If Kirby was Wagner, Ditko was Bach. So these Ditko Sparkles (which also made frequent appearances in his Doctor Strange stories, as in that panel above) aren't straightforward representations of raw power, they're something, like Ditko himself, more inward — more circumspect and sidelong. Look at them: They come at the whole notion of superheroic power from an oblique angle, and in the process, bestow the image to which they belong a touch of something like magic. They're pure comics, is what they are. Like Steve Ditko.